On a chilly November Saturday I ventured out to St George’s Hall in search of the photographic exhibition ‘Forgotten Camp – Exhibition on Shenyang World War II Allied Prisoners Camp’. The exhibition, organised by Shenyang WWII Allied Prisoners Camp Site Museum with the Chinese Embassy and Liverpool City Council, took place between the 7th and 15th of November in the Catacombs Galleries. While the Weeping Window poppy display drew the crowds to the steps of St George’s Hall, ‘Forgotten Camp’ was – somewhat unfortunately – hidden away in the depths of the Heritage Centre. It was only after asking for directions that I was able to navigate my way underground to the entrance of the exhibition. It was perhaps regrettable that such a poignant and important exhibition was so hard to find, as it was most definitely deserving of more exposure. The location did, however, establish a sombre atmosphere. The exhibition began on a gangway in an underground vault where chronologically organised black and white photos decorated the walls, all clearly captioned with a date and a few words to give context to the image. Photographs of political importance–the bombing of Pearl Harbour in December 1941, Japanese troops seizing Asian territories between December 1941 and May 1942, various agreements and treaties being signed–served as a lead-in to the focus of the exhibition: the experience of 2,000 Allied prisoners of war in the Japanese-led Mukden POW camp (now known as Shenyang World War II Allied Prisoners Camp) between 1942 and 1945. The chronological narrative continued as the focus shifted to the events surrounding the establishment of the camp and the years that followed, allowing a comprehensive understanding of the subject. Alongside photographs, maps and cartoons were also on display. The cartoons (drawn by prisoner 1475 William Wattke and prisoner 1650 Malcolm Fortier) lent a personal perspective to the events being portrayed. 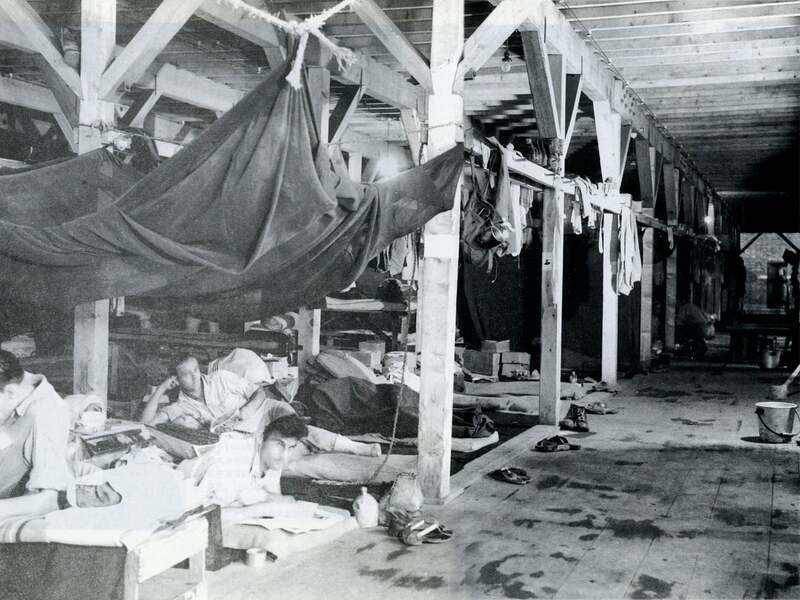 While the everyday life in the camp such as sleeping and eating were depicted in photographs, the cartoons exposed the brutal human reality, namely overcrowded, flea-infested beds, food deprivation that was tantamount to starvation, intense physical labour, and no access to medication (despite the rampant dysentery that affected the camp, and which subsequently caused many deaths). Alongside the narrative of the story of Mukden POW camp was a room dedicated to portraits of prisoners. This room also included, poignantly, a full list of prisoners who had died at the camp, as well as images of letters that prisoners had sent home. The exhibition then moved its attention to the liberation of the camp by the Soviet Red Army in August 1945, and we were brought back to global political events with a photograph of Japan signing their surrender to the Allies on the 2nd of September of the same year. The exhibition concluded with a series of colour photographs taken of former prisoners returning to the camp’s site for the opening of a museum and memorial in 2007 and 2008. A particular highlight was the portrayal of the close relationship between prisoners and the Chinese guards, which has continued to this day. This well curated exhibition proved to be as informative as it was thought-provoking. It has now closed in Liverpool, but more information on ‘Forgotten Camp’, including some of the photographs used in the exhibition, can be found at www.chinadaily.com.cn/forgottencamp.